Your sewing machine may be brand new and right-out-of-the-box. Maybe you brought it home from any number of places that sell previously-owned machines. It could be you borrowed a machine from a friend or family member. It doesn’t matter what type of sewing machine you have or where you got it, there are certain steps you should take before you begin sewing. This article explains the first four steps you should take to set up your sewing machine once it is sitting on the table in front of you. There are so many different sewing machines, it’s impossible to share with you specific details about your make and model of machine. The goal of this post is to provide you a framework so you can begin learning about your sewing machine regardless of brand or model. As you continue to read, I’ve described the first four steps I personally take before I use a sewing machine that’s new to me. The first step in setting up your sewing machine is to look at the paperwork. There are several pieces you’ll want to look at: the safety instructions, quick start guide, instruction manual, and warranty information and registration. The safety instructions could be in the instruction manual, a separate paper, or both. Almost every page of safety instructions I’ve ever seen begins with a sentence like, “Read all instructions before using your household sewing machine.” If you’ve never sewn before, I would definitely read all the safety instructions. Most safety instructions are pretty standard regardless of brand or model. I’ve used many different machines and always scan the safety instructions for anything out of the ordinary. Use the machine only for its intended use. Don’t operate the machine if the cord or plug are damaged or have been exposed to water. Keep fingers away from moving parts, especially the needle. Unplug the machine when it’s not in use, when you are lubricating it, or you’re performing routine maintenance. Of course, these aren’t all of the safety tips, but you get the idea of what I mean by common sense. My suggestion is to scan through the information on the Quick Start Guide to see what’s there then continue reading the rest of this post to get your machine set up. You’ll learn how to prepare the bobbin and thread your machine later on in the Get Ready to Sew! series. If your machine is previously-owned and didn’t come with an instruction manual, more than likely you’ll be able to find it online. To do this, search using the brand/manufacturer and model of the machine. Based on the search results, contact the manufacturer of the sewing machine directly or search online for a third party distributor of sewing machine manuals. Depending on the sewing machine, the manual may be free or you might have to pay a small fee. Regardless, if the machine you’ll be sewing with doesn’t have an instruction manual, you’ll be saving yourself a lot of frustration if you take steps now to get one. If you do have the instruction manual, scan through the table of contents to familiarize yourself with the different sections of it. 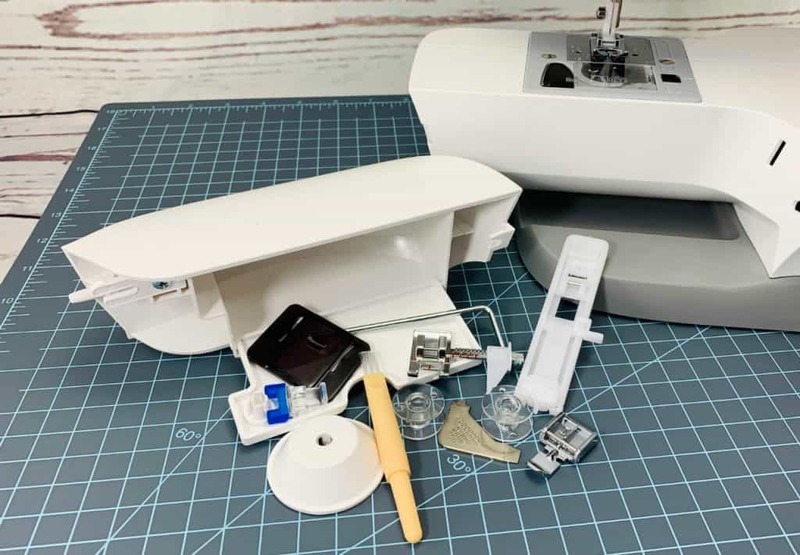 There are a couple of specific sections you’ll want to focus on first – the parts of the sewing machine and the accessories that came with your machine. Find the section that shows and lists the parts of your sewing machine. More than likely there will be more than one page. Focus now on finding out about the accessory box. It may also be called a removable storage compartment, an accessory tray, or even part of the extension plate. Regardless of the name, it will be located near the base of the machine by the needle plate. Remove the accessory box. Now locate the section in the manual that tells you what accessories came with your machine. Accessories included with your machine should be listed, and maybe even pictured, in the instruction manual. Make sure they are all with your machine if it is new. Then put your accessories in the accessory box and put it back on your machine. If you’re missing any accessories on a brand new machine address it immediately. I would start by looking through your paperwork to see if there is customer service/contact information. If not, try contacting the place where you purchased your sewing machine. They should be able to guide you on the steps to take. 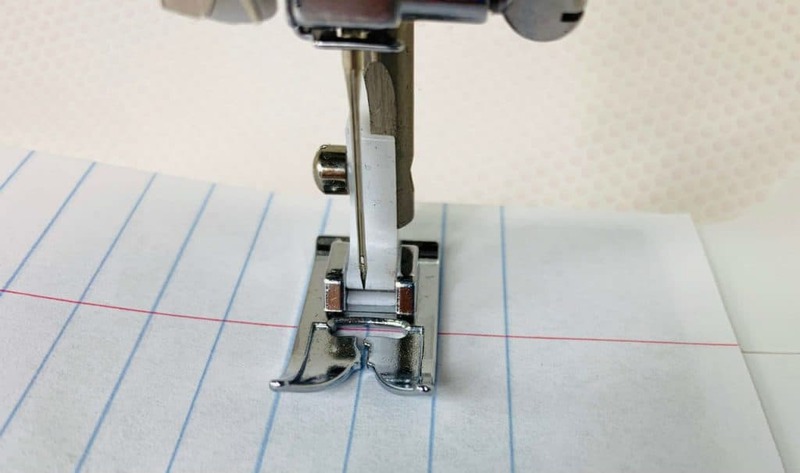 If your machine is not brand new, you need to make sure you have the right bobbins for your machine and, at a minimum, a standard/all-purpose presser foot before you’ll be able to sew. 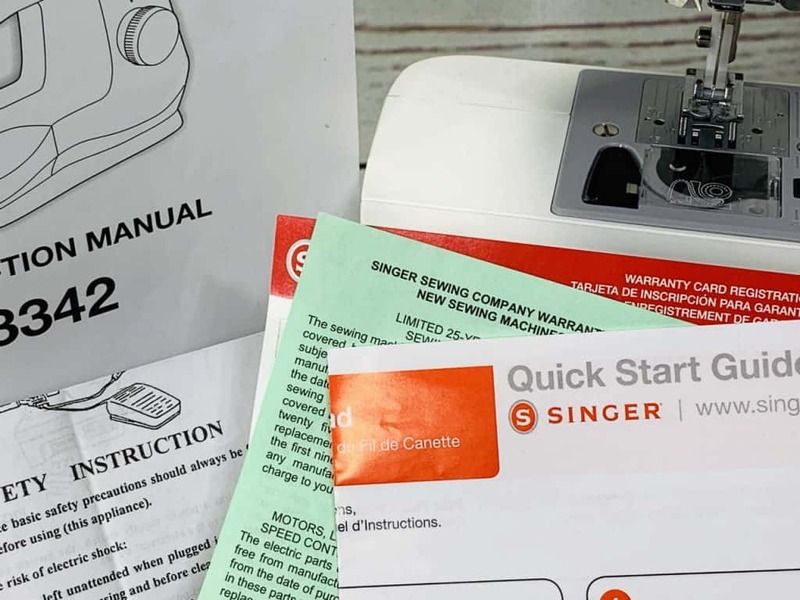 If your machine is brand new, locate the information on how to register your sewing machine for the warranty. Somewhere in the paperwork, there should be an explanation of warranty details. After you register your machine, put this paperwork in a place where you can find it later if you need it. 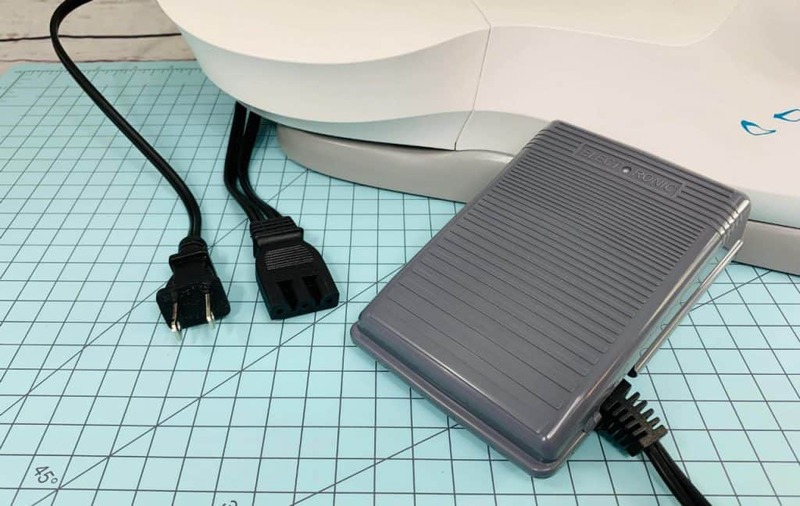 The next step in setting up your sewing machine is to connect it to power. All the machines I have used up to this point in my sewing adventures get their power through an electrical cord that is attached to the foot control (also called a foot pedal). Insert the holed plug into the socket on the side or back of your machine. Then connect the main plug to an electrical outlet. If this is your first sewing machine ever, I recommend checking your sewing machine Quick Start Guide and/or instruction manual for the details on how your machine gets power. Also, reference the manual if the foot control and electrical cord are not one piece. After you have connected your machine to a power source, the next step in setting up your machine is to insert the needle. Needles come in different sizes. They also vary by fabric type. Unless you’ll be working right away with a heavy-weight fabric or a knit, a regular point or universal needle will probably meet your needs for light to medium weights of woven fabric. If your machine is brand new, it may already have the needle in the machine. Don’t skip this section, though. Remove your needle and reinsert it so you’re familiar with how to change the needle. Raise the needle to the highest position by turning the handwheel (also called the flywheel) toward you. Important: If you turn the handwheel away from you, the machine will jam when you start to sew. If the needle is in the machine, hold it while you loosen the screw that holds it in place. Carefully remove the needle from the needle clamp. To insert the needle, make sure the flat side of the needle is facing the back of the machine. Then push it up as high as it will go in the needle clamp. If you are at all unsure about inserting the needle and/or this is your very first sewing machine, scan through the table of contents in the instruction manual and look for the section on inserting/changing the needle. You want to be confident that the needle is securely attached in the machine before you sew. Once you’ve inserted the needle, the next step in setting up your sewing machine is to know how to attach the presser foot. Just like with the needle it’s a good idea to turn off your machine when you attach the presser foot. 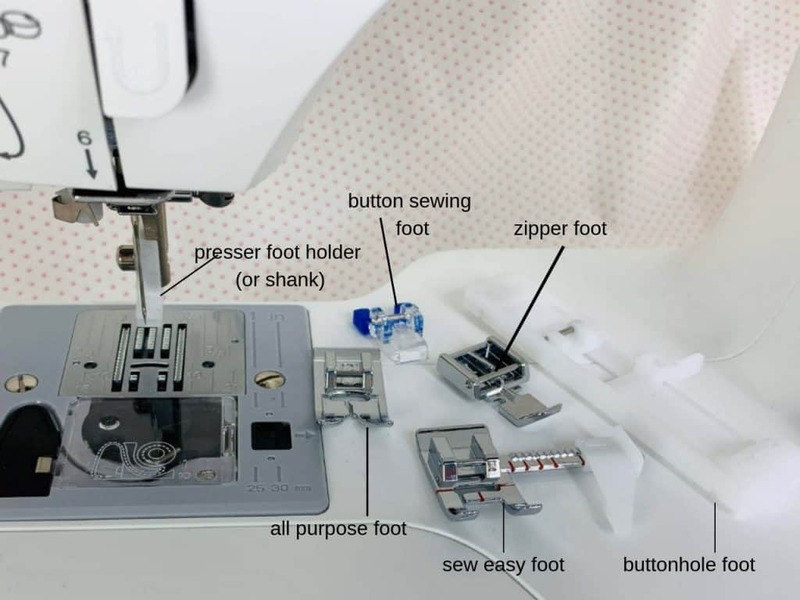 Chances are your sewing machine has several different sewing feet. Looking at the accessory page in the manual, locate the foot that is used for general sewing. It may be called an all-purpose foot, ordinary sewing foot, straight stitch foot, standard presser foot, or something similar. Most of the other presser feet will have a name that describes its purpose, such a zipper foot, buttonhole foot, and button sewing foot. Depending on the type of machine you have, connecting the presser foot may require a lever, a screwdriver, be a snap-on, or a combination of all three. So, scan through the table of contents in the manual and look for the section on changing the presser foot. 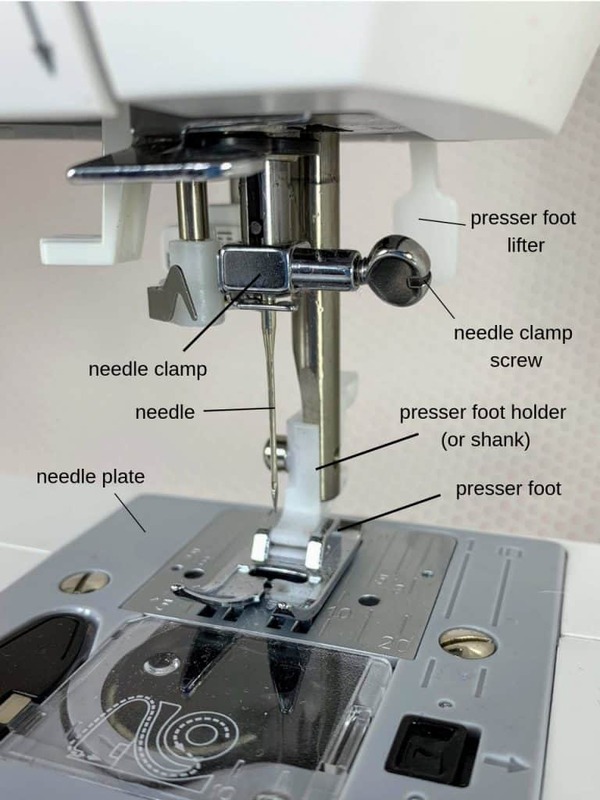 Follow the directions for your machine to attach the presser foot needed for general sewing. Safety Tips: It’s a good idea to turn off the sewing machine before you change the presser foot. Also, if the needle is in the machine, make sure it’s at its highest point by turning the handwheel toward you. Be careful because the needle is sharp. 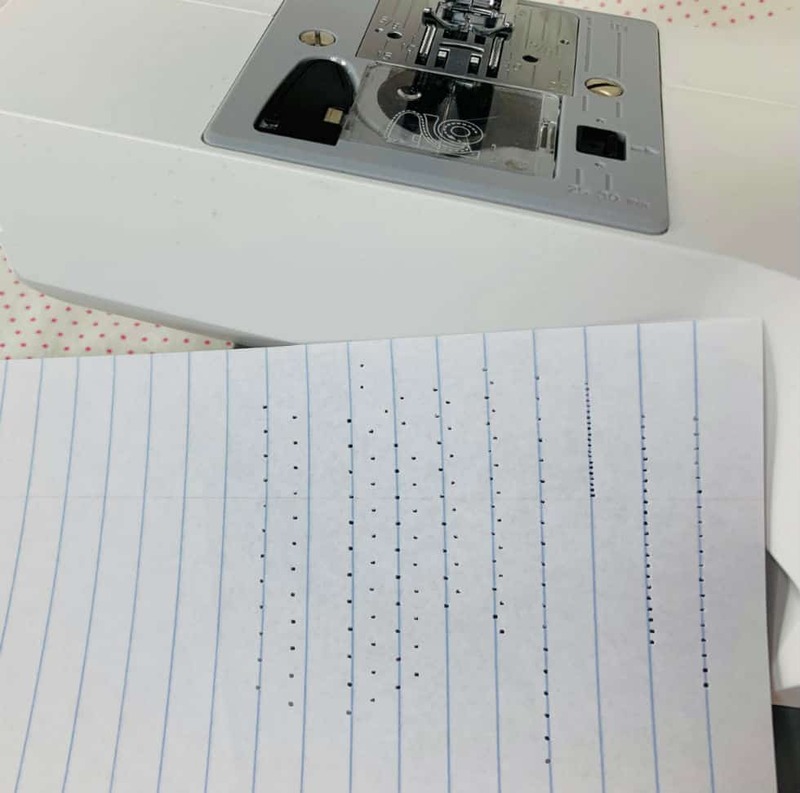 Before we bring any thread into the picture, I want you to experience sewing on your machine. After all, you bought a sewing machine because you want to learn how to sew. So, let’s sew without any thread, fabric, or project in mind. Let’s just sew so you can experience the power of the sewing machine and the control you have over it. To do this you’ll need a sheet of notebook paper. Yep, notebook paper. It’s easy to control and has lines on it so there’s an extra benefit of beginning to practice sewing straight. 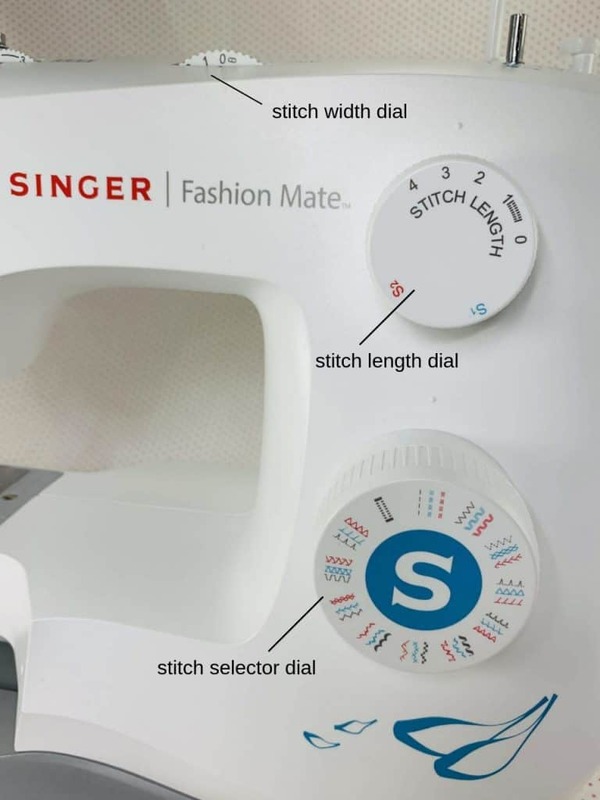 Even though we haven’t talked about the different stitches on a sewing machine yet, take a quick look at the instruction manual and make sure the stitch selector is set to the straight stitch. Then set the stitch length to 3 and the stitch width to 0 (zero). Refer to the instruction manual on how to do this. Now, here we go…let’s sew! Sit in front of your sewing machine. Turn the flywheel toward you so the needle is in the highest position. Lift up the presser foot and insert the paper under it. Line up the needle with one of the lines on the paper. You can turn the flywheel toward you to move the needle up and down. Once the needle is lined up with a line, lower the presser foot. When you press on the foot control, the needle will go up and down and the feed dogs will pull the paper through the machine. Don’t push the paper. Use your right hand to guide the paper so you’re sewing on the line. Be careful of the needle, it is sharp! You control the speed of the machine by pushing down on the foot control. To get the machine to go slower only push down a little. The more pressure you give the foot control, the faster the needle moves. When you lift up on the foot control, the machine will slow down or stop. When you get to the end of a line, turn the flywheel toward you until the needle is in the highest position, raise the presser foot, and reposition the paper on another line. Sew as many lines on the paper as you want. Work on sewing a straight line. Experiment with the speed of the machine and how the foot pedal, needle, and feed dogs feel as they all work together. If you’re feeling adventurous, explore different stitch lengths. Make sure the needle is in its highest position before making changes to the stitch length dial. Notice how the space between the holes on the paper vary as you make changes to the length of the stitch. You can even try setting the stitch selector to the zig-zag stitch and experiment with different widths. From right to left, the needle holes show the straight stitch with different stitch lengths and the zig zag stitch with different stitch widths. You’re probably feeling super excited about getting ready to sew something more than paper on your new machine. First, you did your research so you have the best sewing machine for you and found out where you can buy sewing machines. After that, you made sure you learned about the essential sewing tools you’ll eventually need for a variety of sewing projects. You want to look at the paperwork that came with your machine. The safety instructions are the first thing you need to look at. Then look at the Quick Start Guide (if your machine has one). After that, look at the instruction manual specifically for details on parts of the sewing machine, accessory box, and the accessories that came with it. Finally, look for the warranty information and registration and get your sewing machine registered. Plug the foot control into your sewing machine and connect it to electricity. Attach the presser foot needed for general sewing. Bonus step: Sew on notebook paper to get the feel of sewing and practice sewing straight lines. Threading a sewing machine and sewing fabric may seem like daunting tasks if you’ve never done them before. To help you, I’ve provided step-by-step guidance spread out over six posts. 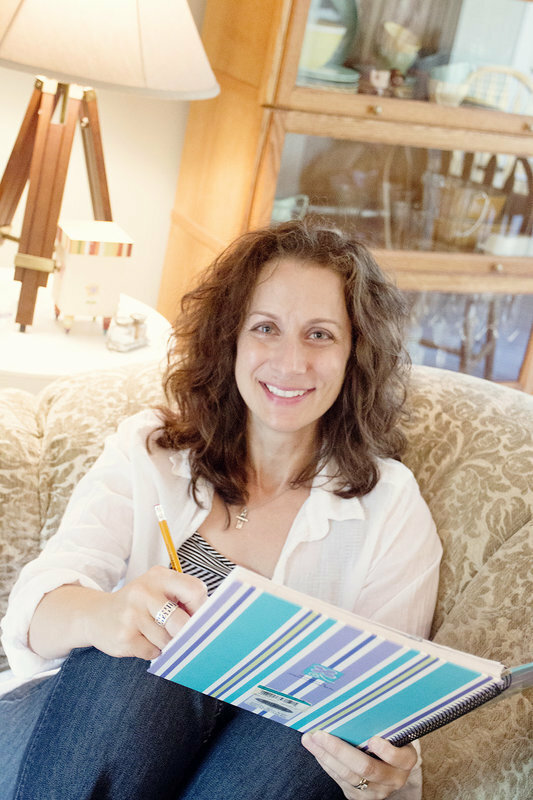 These lessons are broken down so you aren’t overwhelmed with everything at once. You can read the posts one right after the other. Another option is to read them one at a time as you implement the actions I describe. Go ahead and get started! It’s time to learn how to wind a bobbin on your sewing machine.